It is no secret that both my readers and my family love baked oatmeal. They are some of the most popular recipes on my site and I love coming up with new versions of baked oatmeal to share. 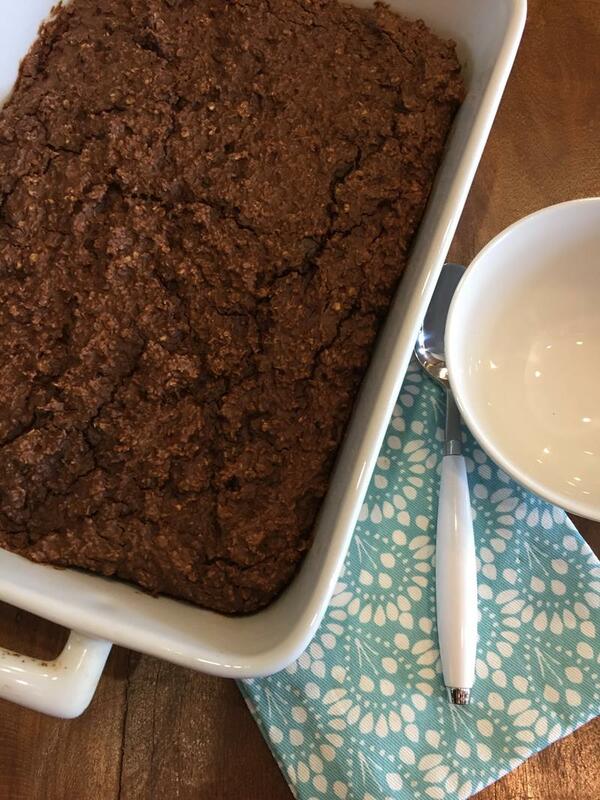 Peanut Butter Chocolate Baked Oatmeal is a recipe that I planned to share during the holidays because it makes a great holiday breakfast. But life happened and I didn’t get it shared. Then it became January and I felt like I should be sharing healthy recipes, not chocolate baked oatmeal recipes. But then I realized that it was oatmeal and oatmeal is healthy, right? So maybe this isn’t the healthiest breakfast, but I am pretty sure it is healthier than many of the boxed cereals that you can buy. Plus peanut butter and chocolate are a classic combination. They just go together. Add in oatmeal and you have a delicious breakfast that your family is sure to love. This recipe is actually based on Peanut Butter Baked Oatmeal, which is the first baked oatmeal recipe that I shared here. I shared it way back in May of 2009. That recipe is still my most popular baked oatmeal recipe on my site. If you have never made it, you need to. It turns oatmeal haters into oatmeal lovers. Today’s version is simply that version with chocolate added, but not just chocolate, I added two kinds of chocolate. I added cocoa and chocolate chips to give it an over the top chocolate flavor. One of my favorite things about baked oatmeal is that it is easy to make ahead. I love to make several pans for Sunday morning breakfast and we reheat the leftovers during the week. Baked oatmeal also freezes great, so you can make it ahead and keep it in the freezer. I have a whole post on freezer baked oatmeal and how it saves me time in the kitchen. In a bowl mix together all ingredients until well combined. Grease a 9×13 pan and spread mixture into pan. Bake for 20-25 minutes. If you like it a little more firm and crunch cook for a few minutes longer. Serve with warm milk over top. Thank you! I love hearing that baked oatmeal helps people enjoy oatmeal! I hope that you enjoy this one. I am so going to make this, both my husband and I are chocoholics so don’t think it will last long at my house. We have been enjoying all your baked oatmeal recipes. Mmmm…thank you for tonight’s dinner idea! 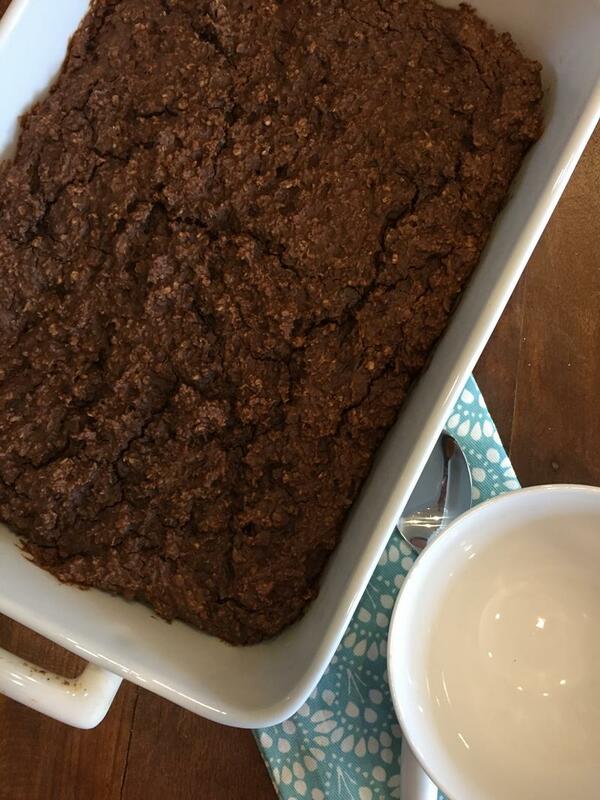 I was already planning to make one of your baked oatmeal recipes and seeing this new one made the choice for me! Hey Lynn, can the 2 eggs be substituted in this recipe? Thanks! I have not tried it, but other readers said they have used things in place of the eggs and it worked. I would say if you have a replacement that you use in other recipes, it should work ok here. I hope that helps.